If you live in an area where there’s cold weather, then you know that certain breeds of dogs do better than others in the ice and snow. Now, we’re taking a closer look at which breeds do best in freezing temperatures and wet snow, and why they adapt as well as they do. Dogs that do well in cold weather all have several features in common. Often, these dogs will have stout, furry paws that allow them to traverse icy terrain. These dogs often also possess dense fur that help insulate and protect them from the harsher elements. While this dog may look a bit like a husky, it has much longer fur and is far larger. These dogs were first bred in Alaska, and are the largest of the Arctic sled dogs. Their fur keeps them warm even in harsh conditions, and they were specially bred to haul heavy loads. This long-haired dog sports a striking pattern of colors, and was first bred as a drafting and driving dog in Switzerland. Both sturdy and large, this dog has a gentle temperament and low exercise needs. 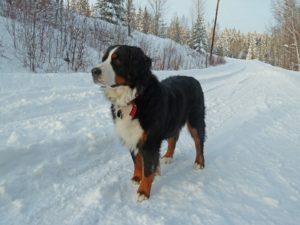 It’s also a perfect dog for a colder climate, since Bernese Mountain Dogs adapt to winter weather well. German Shepherds are known for their herding, guarding, and police work activities. These active dogs have a lot of energy, and learn quickly. They’re also adept at adapting to snow with their wide paws and dense fur. This breed is originally from Siberia, so it shouldn’t come as a surprise that it can handle the cold. The breed was originally used for herding reindeer, hunting, and hauling sledges. Today, they’re playful, gentle dogs that are perfect companions. However, they are very active, and so need plenty of physical and mental exercises. The Shiba Inu has thick fur and a double coat, which means that the spirited breed can handle cold temperatures with little issue. Many owners often comment at how their dogs like to romp through the snow during the winter. There are many other breeds that are also adept at handling the snow. Even if you do have a dog that likes the cold, though, always be conscious of them when taking them out for a day. Even a dog that can adapt to the cold can get chilly over time! Check out our other blog post on how to keep your dog warm this winter.